Supporting our trainees in following their specific areas of interest is just one of the ways that we hope to make Emergency Medicine a more attractive, rewarding and sustainable career path. Having completed ST5 Alistair is now embarking on an exciting OOPE. Starting with a blank piece of paper is always exciting. The potential of a new Word document, an empty canvas or a clean sheet of manuscript paper can be overwhelming. Authors who suffer from ‘writer’s block’ (a problem by which, no matter how many long walks round the park are taken or how much alcohol is consumed, a new idea or ‘what to write to next’ simply will not present itself) will often employ a technique known as ‘free writing’. Pen in hand, they will write as thoughts and words come into their head, without concern for spelling, grammar or punctuation. I’ve just completed a similar ‘free writing’ exercise – sans alcohol I hasten to add, and not because the plot of my latest novel about a boy wizard and his school friends has reached an impasse; rather that I’ve found myself in a new job. A job that hasn’t existed before. On August 6th, I started work as a Clinical Teaching Fellow in Emergency Medicine. While the EDs across Lothian have an ever-growing reputation in the field of academia, and a number of my colleagues have taken time out of specialty training to complete pieces of research in the past, this is the first time the specialty has had a teaching fellowship post all of it its own – in short, I have a blank piece of paper. Where on earth do I begin? A free writing exercise. A large piece of paper and a marker pen. I want to get down everything I hope to achieve over the next two years ‘out of programme’, and then whittle the list down to set some realistic goals. Create myself a job plan, if you will. These next two years are extremely precious – there are well-documented difficulties for senior EM trainees across the UK getting time away from their training programmes because of the pressure on training programme directors and department clinical leads to keep their rotas full. I therefore count myself very fortunate, but I am also aware of the pressure to use this time wisely. 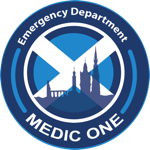 Until August 2016, I’ll be working with the BMJ-award-winning 3RU team and the Resuscitation Research Group to complete a medical doctorate through the University of Edinburgh. We’ll be analysing the non-technical skills or human factors that affect the performance of the 3RU team as they attend to patients suffering out-of-hospital cardiac arrest, as recorded by the video cameras attached to their uniforms. Once we’ve audited their performance, we’ll try to work out the areas requiring improvement, and then design some new training and education programmes for them. We aim to achieve an enhanced 3RU team performance, and, in the long run, save more patients’ lives. On top of my research, I have the opportunity to develop myself as a clinical teacher, and to spend more time teaching medical undergraduates and foundation doctors - in the ED, around the various NHS Lothian hospitals, in the Clinical Skills Centre at Edinburgh University, and at the Scottish Centre for Simulation and Clinical Human Factors at the Forth Valley Royal Hospital in Larbert. So, what does a day in the life of an out-of-programme-researching Clinical Teaching Fellow look like? Well, for a start, my working day can begin at 9am – which, after the grind of a 100% clinical rota for the past seven years comes as a (temporary) relief. I still work one weekend a month in the RIE ED, so as to keep my hand in with the ever-progressing field of Emergency Medicine. The best thing about the CTF job is the daily variability. Some days will be teaching or delivering a lecture, and some days will be running simulation sessions or small group workshops. Some days will be spent in front of a very large computer screen analysing videos, and some days will be spent out on the road with the 3RU guys. Some days will be at the library with the laptop reading through a seemingly endless list of papers, but some days will still be doing the best thing there is about EM – treating our amazing patients. And some days… well, some days I haven’t quite worked out yet. There are still some spaces on the piece of paper to fill. Older PostWell done Medic One runners!